Friday Fun is all about simple craft projects for family, classroom and group craft time. Some families are setting aside a time each week for family crafting fun. In some communities Friday Craft Nights have become quite popular. Why not join in the fun? Greeting cards for kids: For pop-up cards and more easy to make greeting cards that children can create, see the projects listed in Greeting Cards Kids Can Make. Also, check out Gifts Kids Can Make for Dad and Gifts Kids Can Make for Mom. Paper Flowers - See how easy it is to make paper flowers. It requires no patterns and uses simple materials. This is a skill well worth learning! Easter Pennant Banner - Make colorful pennant flags then string them together to make a banner for Easter. Use these banners to decorate around your home or in the classroom. The pennant flags are also a nice addition to an Easter basket. Peek-a-boo Easter Egg - Learn how to make a magical world inside an Easter egg with real eggshells, cutouts or stickers, and your imagination! Smaller crafters may need help snipping their eggs. Basic Egg Dyeing - Aunt Annie teaches you how to make a dye bath for brightly colored Easter eggs. Dye your eggs a solid color, or marble them for added oomph! Handwoven Bookmarks - Make a handwoven bookmark simply and easily while learning the basic concepts of weaving using a cardboard loom. The bookmark makes a wonderful gift, or maybe use it as a rug in a doll house. Make the loom in different sizes and sew the fabric into coin purses, coasters, hot pads—whatever you can imagine! Tissue Paper Painting - Make colorful tissue paper with this super easy technique. Simply pleat a piece of tissue paper and paint the folded edges. Repeat the process once or twice to create an even more exciting design! The painted tissue paper may be used to wrap packages, to cover box lids, line envelopes, and in greeting cards, suncatchers, collages, and much more. Suede Leather Pendant Necklaces - In this project, create a necklace from scraps of suede leather and a length of plastic lacing. This is a simple leather craft suitable for beginners and children. Snowflake Window Stencils - Paper snowflakes and a little dab of paint go together to decorate your windows. Even the youngest children in a family or group can help with this project by dabbing paint on the stencils. Easy Paper Snowflakes - Learn an easy way to make snowflakes from tissue paper. With this technique you can make a whole flurry of snowflakes in a hurry! Using tissue paper makes cutting through many layers easier, but you can use any lightweight paper you like. Easy Valentine Cards - Simple, easy, and effective. Draw hearts freehand for this Valentine card, and just fold, cut and glue! Cutout cards are a great Valentine’s Day craft for children and classroom groups. Valentine's Day Candy Jar - It is easy to recycle an empty jar into a wonderful container for Valentine’s Day candies. Just add some cutouts from old Valentine’s Day cards or leftover Valentine's Day napkins to make a decorated jar nice enough to give as a gift. Valentine Crown - Make this royal Valentine crown for that special someone, or as a fun party craft with a group of children. Just a few simple supplies are needed to create this very special Valentine. This craft can be used for any holiday. Paper Heart Chains - Create chains of paper hearts by cutting accordion-folded paper strips. You can easily make paper heart chains for Valentine's Day. It's just like cutting Paper Doll Chains—only easier! Use strips of red paper, plain or patterned, to decorate for a party, in the classroom, around the house or for a special dinner with your loved ones. Crayon Batik - Learn how to imitate on paper the fabric decorating technique from Java called batik. The process uses crayons to color a design on paper, that is then wadded and painted with black to make the cracks that are typical to batiks. You can use the resulting pictures to make cards, decorate notebook covers, or hang on the wall. Snow Scene in a Jar Snow Globe - Whether you have snow where you live or not, you can have wintertime fun by making a wintry snow scene in a jar. All it takes is a few plastic toys, rocks, glue, glitter and water to turn a small jar into a winter wonderland where a gentle shake makes it snow. Pencil Toppers - It’s fun and easy to make original pencil toppers with Homemade Modeling Dough. Make a simple dough in less then 15 minutes, and use your fingers to shape fun, fanciful, or beautiful creations of your own design. Aunt Annie has included suggestions for creating easy, silly and cute pencil toppers. Finger Paint Recipe - Why bother with a brush? Cavemen didn’t mind getting messy in pursuit of their art, and you won’t either with this simple finger paint recipe. Milk and Cookie Placemats - Kids of all ages will have fun making these placemats that are sized for a snack of milk and cookies. Just cut out images from old greeting cards, calendars or magazines that relate to the theme for the placemat and cover with clear contact paper. That's it! Simple as eating a chocolate chip cookie. Yum! Pumpkin Seed Poinsettias - Poinsettias are the flower of the Christmas season. These brooches or Christmas ornaments made of pumpkin seeds will bring out the holiday cheer in all who see them. Make one for yourself or make several to give as gifts. Grandma will cherish a cheerful brooch made by the kids. Cookie Cutter Felt Ornaments - Simple and durable ornaments can be made with cookie cutters, felt and imagination. No sewing is required! The cookie cutters are used as templates for making the ornaments or use Aunt Annie's printable pattern with Christmas-themed templates. Cinnamon Clay Recipe - This recipe makes a sweet smelling dough that can be made into ornaments or package decorations. Just mix together applesauce, cinnamon, and a bit of glue to create a clay that is perfect for rolling out and cutting shapes with cookie cutters. Shiny Paper Beads - See how easy it is to recycle paper scraps and magazines to make colorful paper beads. After winding the paper into beads and varnishing them for a shiny finish and durability, the beads can be strung into bracelets, necklaces and even beaded room dividers! Thanksgiving Napkin Rings - Thanksgiving is a time for the family to gather and share experiences. You can start the sharing by making these simple napkin rings with your child. Not only will you have fun, but you will also make something special for the Thanksgiving table. Use the same basic idea with simple variations for other holidays. Fall and Thanksgiving Refrigerator Magnets - See how easy it is to make seasonal refrigerator magnets for fall and Thanksgiving with Homemade Modeling Dough. Make the dough in less than 15 minutes, and then use your fingers to shape magnets using ideas in the project or design your own creations. Paper Doll Chains - Create a chain of paper dolls by cutting multi-folded paper strips. Learn this basic paper cutting technique with paper dolls then, let your imagination run wild! Cut paper chains with themes for every season and every special event. They make great decorations for parties, classrooms and your home. Dracula's Blood Recipe - Here's a recipe to make fake blood for Halloween. Drip some from the corners of your mouth, and in your best imitation of Dracula say, "I want your blood." Colorful Tissue Ghosts - What could be cuter than little ghosts in a bowl? Tissue ghosts are an easy, inexpensive way to decorate for Halloween. In this project, you'll see how to make a colorful version of the traditional tissue ghost by adding fading color accents. Halloween Mobile - Mobiles of ghosts, jack-o'-lanterns, witches, bats and black cats make great decorations for Halloween. Follow the instructions in this project to make a quick and easy mobile using simple materials. After completing this project you will be able to make mobiles for any holiday or theme. Stained Glass Leaves - The colors of fall are warm and cheerful. Capture these colors with this stained glass-like decoration that is created using recycled crayons!! Combine the craft with a walk through the woods for an enjoyable fall afternoon. Trinket Box - Use recycled materials to make this trinket box. All it takes to make this cutie are empty cardboard tubes, a cereal box and scraps of ribbon or paper. You are sure to want to make more than one! Clip-Art or Photo Stick Puppets - Nothing is off-limits in this creative puppet project. Craft simple stick puppets from magazine photos, clip art, coloring book cutouts, or other paper images! You can even use photos you’ve taken to put on a special play starring you and your friends—just make sure to ask Mom first. Silly Faces Mix-and-Match Cards - Just a few simple materials and a little instruction is all it takes to make a set of mix-and-match cards. Cut all the cards into three pieces and mix them up to make silly faces. Giggles are a sure thing! Picture Puzzles - Turn drawings, photographs or any image you love into a picture puzzle. This is a simple craft for groups of children. Why not have each child make a puzzle and then trade the puzzles back and forth so everyone has the chance to work several puzzles. Thaumatrope (or Mini-movie) - Kids will have fun making this spinning toy known as a thaumatrope (or mini-movie.) It appears to magically create one picture from two and demonstrates one of the visual concepts behind movies. Chinese Paper Lanterns - Chinese paper lanterns make colorful and inexpensive decorations. Best of all, they are so quick and easy you can get the kids involved in making them. Follow the simple instructions in this craft project to make colorful lanterns using a single sheet of paper. Spy Glass Color Wheel - Use red, blue and yellow cellophane to make a color wheel that teaches about combining the primary colors. Have your child see how many colors can be made by overlapping the cellophane layers. To see even more colors, the color wheel doubles as a spy glass that your child can look through to make the colors around them change. Ring Toss Game - Make rings and stakes for the game of ring toss. Find out how far and how accurately you can throw a set of rope rings with the classic game of ring toss. Play it inside at a party, or outdoors at a picnic or cookout! Aunt Annie includes a set of rules so everyone knows how to play. God's Eye - If you are looking for a craft that kids love and is great for groups, look no further. God’s Eyes are made with just a few supplies and even small children get wonderful results. Tic-Tac-Toe Travel Game - Tic-tac-toe is a classic, whether played with pen, lipstick, or this handy reusable game board! Take it on car trips, picnics, or to the beach. Wherever you go, X (or O) marks the spot! Doorknob Hangers - In this project, see how easy it is to make doorknob hangers to communicate with your family and friends. Create a hanger with any message and pictures you like. You might put 'Do Not Disturb' on one side and 'Wake In Time for School' on the other side. Use your imagination! 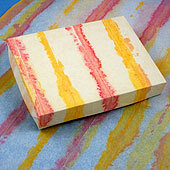 Bubble Print Paper - Use paint and bubble blowing liquid to make this kid-safe alternative for marbled paper. With this technique you will make pastel prints of soap bubbles on paper that then can be used for other craft projects. Circly Paper Chain Snake - Link rings of construction paper together to form a long multi-colored snake that makes a terrific decoration hung from the ceiling, draped around the room, or framing a bulletin board. Turn the activity into a contest to see who can make the longest snake, create the funniest (or scariest) snake, or the most creative snake. Bath Buddies - In no time flat, you and your kids can make enough soap buddies for weeks of bath time fun! Kids of all ages enjoy the squishy fun of making little soaps in a variety of shapes and colors. Shape them into balls or create cute shapes with soap molds. Fourth of July Crackers - Make a Fourth of July cracker that goes POP! See how to make this novelty box that is shaped like a firecracker and makes a pop sound without any fire. Best of all, you can use it over and over again! It makes a great party favor or fun gift box. Use it for any celebration, not just the 4th. Simple Father's Day Cards - Don’t yell it, spell it! Handmade cards for Dad that spell out “D-A-D” are an easy Father’s Day craft project with results that Dad will cherish. Kids will have fun making these simple paper cutout cards and giving them as gifts, and Dad will appreciate the love and effort put into them. Sweet Strawberries - Make strawberries from walnuts in the shell that are painted red. This is a quick and easy project that both kids and adults will have fun doing! The strawberries can be used as decorations on gifts or around the house and make a wonderful gift to brighten anyone's day! Coin Barrettes - Use a few pennies and a store bought hair barrette back to make these lovely hair holders. For silver barrettes, use dimes or nickels and mix up the coins for another look. The craft is quick and simple and the results are very attractive! Make a set for yourself or to give as a gift. Stars and Stripes Pennant Banner - Make red, white and blue pennants with stars and stripes, then string them together to create a banner. The banner can be used to decorate inside or outside for the 4th of July or anytime you have a patriotic theme party. Easy Pinwheel - Just in time for a breezy spring day, make this colorful paper pinwheel with nothing more than paper, a pencil and a straight pin. Children of all ages will be delighted with this whirling windmill. Make several as party decorations or favors! Bread Clay Recipe - This recipe makes a durable and very pliable clay that can be colored vibrantly. This clay is particularly good for making items that will get heavy use, like beads and playing pieces for games. All you do is mix white glue into shredded white bread and add color with a bit of paint. Easy Mother's Day Cards - Mom will love these pretty cards with simple paper cutouts that spell out "M-O-M." Use whatever crafty things you have on hand to add your special creative touch. Love Bugs - Make cute little bugs to give as gifts. They are molded in plastic spoons using plaster of Paris. This craft is great for Valentine's Day, Mother's Day, or any gift-giving occasion. Children of all ages, even as young as two, will enjoy making these love bugs as pins or magnets. Weave a Placemat - Turn a sheet of construction paper into a placemat with paper weaving. These simple to make colorful placemats will brighten your table. Select a color theme and get weaving! Woolly Octopus - In this craft project, learn the British way of making a yarn octopus. This technique is a disarmingly simple way to make a cute toy with items found in most people's homes, and it will use up those leftover scraps of wool (yarn). Easter Chick Cards - See how easy it is to make an Easter card by tracing your child's hands. This is a fun project for kids of all ages. Even toddlers will enjoy this project since cutouts of their traced hands are used for the wings. Marbled Eggs - Here’s a technique for making marbled eggs that requires no special materials, and produces beautiful results with very little effort. Washcloth Bunny - What could be more fun than making a cute little bunny for Easter? Start with a washcloth and in no time you'll have a little sweetie to add to an Easter basket, give as a gift or as a decoration that doubles as an Easter egg holder! Shamrock Flag Banner - Show off your St. Patrick’s Day spirit with a shamrock banner. Make this easy paper flag banner using construction paper and the printable shamrock pattern. Hang the banner in a doorway, over the mantel, or in the window—anywhere you want to show your Irish green! Clay Charms and Pendants - Make charms and pendants for necklaces and bracelets using Homemade Bread Clay or commercial air-dry clay. Make the heart and flower pendants and heart charms for yourself or to give as gifts. When strung on cord or a chain, they make perfect gifts for Valentine's Day. Seed Catalog Garden - Make a garden in the middle of winter by cutting up seed catalogs. Cutting up the catalogs, making the garden, and playing with it will keep kids busy for hours. Stuffed Felt Names - Kids love to see their names spelled out! In this craft project, see how to cut out, sew, and stuff individual felt letters, and then join them together to create a bright and cheerful personalized wall hanging that's perfect for the bedroom door, on the wall, or over the crib. Chocolate Spoons - It's easy and fast to make these tasty treats, then wrap them up with ribbon and cellophane. Use these fancy spoons to add a special touch to a dinner party, make a unique Valentine's Day gift, or brighten someone's day! Make mocha coffee in a flash by using a chocolate spoon to stir hot milk into your coffee! Valentine Garland of Hearts - Make this delightful tissue paper garland that is sure to brings smiles. Drape it over doors, in windows, over furniture, along stairs. It is quick and easy to make. required—just cut, glue and string. Paper Cup Party Favor - Half the fun of giving a party is selecting a theme and making the decorations. You can easily and quickly make party favors for any theme by decorating paper or foam cups with ribbon and images printed from your computer. Finger Painting Basics - The kids (and grown-ups, too) will have great fun smearing paint on paper and creating fanciful pictures. This craft project goes over the basic steps for doing finger painting and gives tips to enhance your finger paint masterpieces. Kids' Four Patch Birthday Cards - See how easy it is for kids to make birthday cards from simple materials. These cards feature fancy paper that the kids make, and are finished off with a hand drawn cartoon stick figure and a message balloon. Every card is unique and showcases the creative ideas of the child artist! Artwork Bookmarks - These bookmarks are simply made from artwork that you are willing to cut up, along with two pieces of clear contact paper. This is a great way to recycle your less-than-perfect artwork or preserve your child's treasured drawings. Paper Angel Chains - Create a chain of paper angels by cutting folded paper strips. It's just like folding and cutting paper doll chains! The angels stand on their own and can be used to add some sparkle anywhere you are doing some holiday decorating! Christmas Ornaments, Magnets and Figurines - See how easy it is to use Homemade Modeling Dough to make Christmas-themed ornaments, refrigerator magnets, and figurines. Use your fingers to fashion the modeling dough in fun shapes for Christmas using the ideas in this project, or come up with something new of your own invention! Shaped Cards for Christmas - Make simple and fun holiday cards in the shape of a pine tree, Santa, or an angel. These cards are easy enough for younger children and people with special needs to make. While the cards are very simple to make, they are easily enhanced with glitter, cotton balls, sequins, and other creative touches. Let your imagination soar! Miniature Christmas Tree Ornament - A simple cone of green paper can be made into an ornament in the form of a Christmas tree that everyone will enjoy. With just a few standard supplies, you and your children can make and decorate these little paper Christmas trees. Make cones from other colors of paper to create bell and Santa hat ornaments. Straw Bead Necklace - In this project, you'll see how to take the classic drinking straw bead necklace and step it up a notch! You'll use decorative paper strips to cover the soda straws before cutting them into beads. This is a great way to recycle your leftover paper scraps. Suitable for all ages! Miniature Turkeys - In this project, you'll make miniature turkeys modeled from Homemade Modeling Dough or air-dry clay to use as playing pieces for the game of Turkey Trot. Or make the turkeys for a diorama, to decorate for Thanksgiving, or just for fun! Apple Turkey - Make a turkey for displaying Thanksgiving dinner place cards. The turkey is made with an apple, a paper napkin, some nuts and candy, and wiggly eyes. It’s fun and easy to do and all your guests will be delighted with this colorful turkey. Multicolor Binoculars - Make binoculars from recycled toilet paper tubes and squares of colored cellophane for lenses. Wrap the tubes in black construction paper (or paint them black) for an authentic look or let your imagination loose by decorating the cardboard tubes any way you like! Halloween Treat Bags - Give your Halloween trick-or-treaters a colorful handmade bag filled with treats! Each bag holds several pieces of candy, two cookies, some caramel corn or a small toy. They are great for Halloween party favors, too! Recycled Tin Can Candle Holders - Imagine quiet conversation on a patio or porch in the light of flickering candles. These simple candle holder luminaries are made from recycled cans that are left plain or painted. The candle holders are fun to make as a family or group project. Creepy-Crawly Spider Bracelet - Make a creepy, crawly spider that can wiggle and twist about with a few movements of the wrist. Traced fingers are the basis for this animated spider toy, and a paper fastener allows it to swivel around. This is a fun and easy Halloween project that is especially good for mixed-age groups of children. Recycled Crayons - In this project, make new crayons out of old broken ones. Your kids will have fun making these crayons that are better than new. The recycled crayons also make a good gift when placed in a cellophane or plastic bag tied closed with pretty ribbon or yarn. Seal Gum Recipe - Learn how to make homemade seal gum (lick and stick glue) for stickers and envelopes. With this adhesive you will be able to make your own stickers from ordinary paper. Make stickers from drawings or stamped images, clipart or pictures cut from wrapping paper—the sky's the limit! This lick and stick adhesive also works great on handmade envelopes. Quick Papier-mâché Pulp - Use this craft recipe to quickly make a colorful papier-mâché pulp that can be molded into shapes. This paper pulp doesn't require glue and you can skip painting the finished pieces. This is a great craft material to use for family, group or classroom crafting time. Floral Wire Mobile with Origami Flying Birds - Mobiles make terrific decorations in the home, office or classroom and are a great way to display and enjoy your craft creations. In this project, see how to use floral wire to make a mobile of easy to fold Origami Flying Birds or other lightweight items. 3D Refrigerator Magnets - In this project, learn how to make refrigerator magnets out of painted molded shapes created by pouring plaster of Paris into candy molds. This is an ideal project for groups of varying ages and skills, and the finished magnets make great gifts! Vegetable and Fruit Printing - Learn how to make simple relief prints using vegetables (and fruits). This printing technique is simple enough for very young children, while being versatile enough for older children and adults. The project features the classic potato print, as well as, vegetables and fruits that are a bit less traditional in printing. Homemade Bubble Solution - Playing with soap bubbles is pure fun and fascinates even the youngest child—cats and dogs, too. It's amazingly simple to mix a bubble solution from just a few ingredients. Homemade Modeling Dough Recipe - Squishable, squeezable, and versatile, this easy to make modeling dough can be crafted into paintable masterpieces or reused many times as a play dough. Add color with a few drops of food coloring and see what sculptures you can create! Yarn Octopus - See how easy it is to make a little yarn octopus that is the perfect size, about 5", to hang on your backpack. These little cuties are just right for your yarn leftovers. It also makes a terrific gift or craft bazaar sale item. Sponge Stamps and Art - Do you know that ordinary kitchen sponges can be used to make stamps? Children will want to make a variety of stamps to create artistic masterpieces for display in the refrigerator door gallery. Follow these simple instructions and you will be able to make stamps of your own design in minutes. Magazine Holder - Here’s a craft that is fun to do, recycles empty cereal boxes, and organizes those stacks of magazines, paperback books and miscellaneous papers around the house or in your child’s bedroom. Square Petal Envelope - Learn a surprising technique for making square petal envelopes. These simple envelopes are inspired by Japanese gift wraps and require little or no adornment. They are great for wrapping flat packages or gift cards. Children's Craft Box - Make it easier for your children to 'create' by filling a box with craft supplies that's just for them. The box is theirs to use however they wish. The only rules are they must lay out the small plastic table cloth before starting and when finished they must clean up the mess. Origami Flying Bird - A bow isn't the only way to top off a gift package. All it takes is a square of paper and a few folds to make an origami bird to decorate your present. The flying bird has fewer folds than most origami birds. This makes it an ideal origami craft project for beginning folders and children. Ice Cream in a Bag - What goes best with kids and a hot summer day? Well, ice cream, of course! With this recipe and technique each child gets to make an individual serving of ice cream, and it only takes a few minutes from start to finish. Go ahead, get going—you’ll have a ball! Patriotic Star Garland - Cut five-pointed stars from red, white and blue paper and string them to make a garland! Use the garland to decorate for Memorial Day, Flag Day or the Fourth of July. Paper Mosaic - Learn how to make paper mosaics to decorate crafts and give as gifts, while recycling the paper scraps from other projects. Make one for Mom, Dad, Grandma or Grandpa. Washcloth Bath Bags - Sew up a nifty bag for your bath from a washcloth and ribbon. Put soap or bath salts inside and relax in a sudsy tub of warm water. But don't stop there! The bath bags also double as bath mitts for the kids. They also make great gift bags for handmade soaps! Layered Soaps - In this project, learn how to make soaps with different colored layers using the melt-and-pour soap making technique. You can create guest soaps in colors to match your kitchen or bath decor or to give as a special gift. The whole family can have fun making soaps. Memory Game - Make a set of cards for the game of memory. This is a fun and very easy project that young kids really love doing! It is great for families or groups, and with a little preparation by the adult or teen leaders, this project is fast and fun. Clip Art Bag Puppets - More puppet fun! This time using clip art to make paper bag puppets. Quick, easy and fun activity for families and groups. Punched Bookmarks - You've been cutting, folding and pasting to make your crafty creations, but now there are bits and pieces of paper left over. Recycle that leftover paper to make simple and beautiful bookmarks using a hole punch. Keepsake Booklets - Gather those stacks of school papers together and make them into a quick and easy booklet. This simple technique can be used to make booklets of all sorts—diaries, collections of articles and clippings, school reports and more. Kids' Pocket Mother's Day Cards - This craft project is a kid version of the grown-up Pocket Greeting Cards Tutorial. These fun and unique cards for Mother's Day feature a pocket on the front that the kids can fill with little gifts for Mom. Sticker Fun - Not only does every child love stickers, but stickers are also an easy way to decorate and personalize any of your handcrafted cards or printed output. Whether it's a card, letter, certificate or photo, a sticker is a fun way to liven things up! Use Aunt Annie's sticker sheets or design your own stickers to use, share and trade! Jumping Origami Bunny - This funny bunny paper craft can be folded in just a few steps. Press down on his back to watch him "spring" up! The bunny	is a twist on the traditional origami leaping frog. Purim Crown - Make this royal crown decorated with six-pointed stars for Purim. It is a fun party craft with a group of children. Just a few simple supplies are needed to create this very special crown featuring Stars of David. Valentine's Day Pins - Create plaster of Paris pins using simple candy molds, pin backs and paint. Choose a candy mold with heart shapes to create beautiful Valentine's Day pins to give as presents to your loved ones. Candy Cane Reindeer - Children will enjoy transforming a candy cane into a reindeer using a few craft supplies and a bit of glue. This reindeer is a great decoration for the tree or a fun party favor. It's a craft that has long been a holiday favorite for kids and teachers alike. Gift Tags from Recycled Cards - Recycle greeting cards and paper scraps into fun and unique gift tags. The whole family can join in on the cutting and pasting to make these special additions to your holiday gifts. The tags can even be grouped into packages for sale at a Christmas bazaar or for a fundraiser. Pine Cone Turkey - Turn a pine cone into a colorful turkey to brighten your Thanksgiving table. This is an easy craft project for children that can be combined with some outdoor fun. Take a walk in the woods to find pine cones; then, with some pipe cleaner and glue magic, turn them into little turkeys. Sew-a-Pumpkin Halloween Favor - Create these truly unique pumpkin-shaped Halloween party favors filled with candy corn. This is an easy craft that's a twist on the traditional Sewing Cards craft. Great for group, family and classroom crafting! Kids' Halloween Spook House Dangler Cards - In this project, kids make a house spook from black construction paper with an opening to peer inside at the ghostly residents. This craft project is a kid version of the grown-up Dangler Cards with jack-o'-lantern danglers for Halloween. Kids' Serendipity Squares Father's Day Cards - This craft project is a kid version of the grown-up Serendipity Square Cards tutorial. Like in the adult version, scraps of paper are used to make colorful serendipity squares that can be combined in many ways to make one-of-a-kind greeting cards for dad! Halloween Trick or Treat Bags - It's quick and easy to make trick or treat bags in any size you like to collect treats as you go from door to door. All it takes is a stack of books and a sheet of paper to make the basic bag. You can also create smaller bags for Halloween party goodies or to hand out to the trick-or-treaters who come to your door! Jelly Bean Carrots - A sweet supplement to your Easter treat basket, jelly bean carrots are simple to make and fun to eat! Orange jelly beans, plastic wrap, and a little creativity help kids and grown-ups create this satisfying spring party favor. Finger Painting on freezer wrap using homemade finger paints is fun and easy! 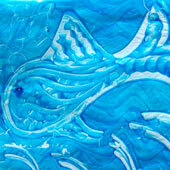 Make designs on tissue paper in any colors you like then use it to cover boxes or wrap gifts.